Join tapas lovers on the vibrant cellar terrace every Sunday from 11h00 till 17h00 this summer until the end of March for a wide selection of tapas dishes. Better still, start with tapas and stay for a more substantial lunch at the Franschhoek Kitchen, the Holden Manz signature restaurant situated above the cellar. The tapas menu, created by Chef Bjorn Dingemans who joined the Franschhoek Kitchen after honing his craft working alongside some of the finest chefs in London, changes weekly and includes all the favourite classics. From pat�s, risotto balls, crispy squid and artisanal cheeses to a double shot of watermelon gazpacho, the tapas dishes are priced between R20 and R40. Enjoy this array of tastes with Holden Manz wine by the glass at R25 or R90 per bottle to share with friends. With house music creating just the right chilled out vibe, this is the perfect summer escape to laze away your Sundays. For Sunday Tapas or bookings at the Franschhoek Restaurant, Call 021-8762729. 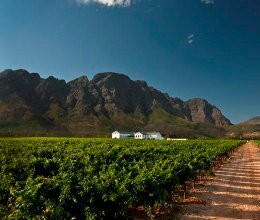 To reach Holden Manz, turn right at the Huguenot Monument in Franschhoek and follow the signs for two kilometres.